The first signs of our veggie garden are beginning to show. My husband started seeds for the garden and today we noticed they are up and have vented the top of the seed starter tray. 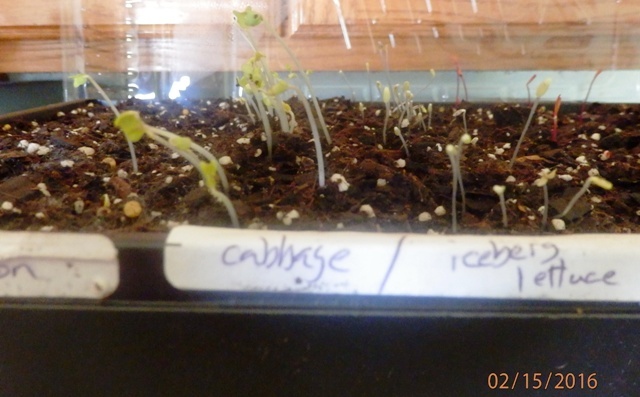 We have cabbage and iceberg lettuce. 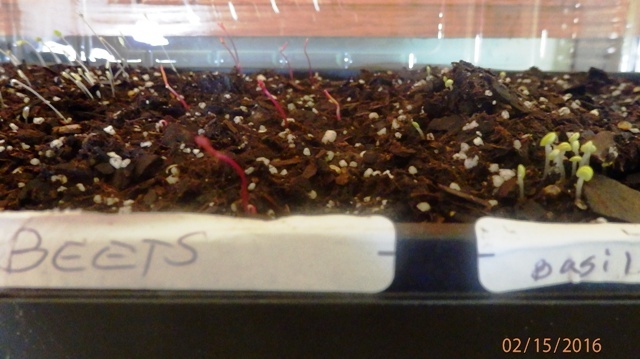 The beets and basil have started too. I think they will do well. I was needing a single vase a week or two ago and didn’t have one. 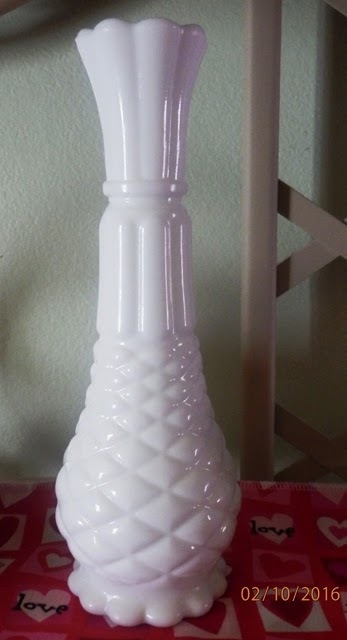 I was at a flea market last week and found this pretty vintage milk glass bud vase. It is diamond cut in the pineapple pattern. I finally finished one of the small quilts I’ve been working on. It didn’t happen without a glitch though. 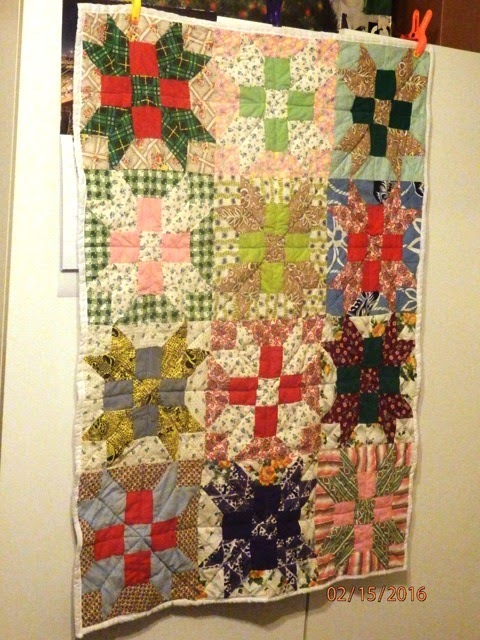 Here’s the quilt finished. Here’s the glitch. I had to stop and have some repair done on my machine. 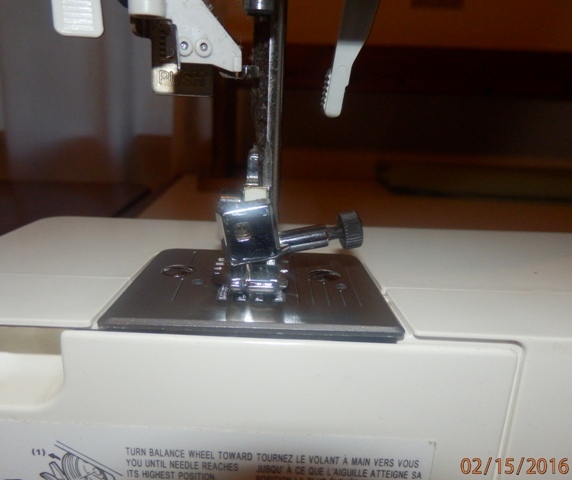 I was sewing along and then the casing that holds the needle just dropped out of the machine. Thankfully my needle was not broke or bent, amazingly. So that’s Monday for me. It started good, had a glitch, then ended good. Isn’t that how life goes? Everything is going along good, then a glitch happens. How you overcome that glitch depends on how you face it. In the case of my sewing machine, I turned to my husband. I have never had my machine do anything like it. He repaired it, and showed me what I need to do if it ever happens again. I am now prepared with the knowledge and the tool to take care of it next time. But what about bigger things in life? How do you overcome glitches then? I personally rely on my relationship with God. I search my heart and pray asking God to reveal what I should do, and at some point, either through discernment or Scripture, I know what needs to be done or what to expect next. These verses sum it up nicely. I keep my eyes always on the LORD. With Him at my right hand, I will not be shaken. Therefore my heart is glad and my tongue rejoices; my body also will rest secure, because You will not abandon me to the realm of the dead, nor will You let Your faithful one see decay. You make known to me the path of life, You will fill me with joy in Your presence, with eternal pleasures at Your right hand.